Listed below are homes for sale in Sauk Creek, a neighborhood located in Far West Madison, WI. Listings are updated multiple times a day from the SCWMLS. For more information about any of these Sauk Creek homes for sale, just click the "Request More Information" button when viewing the details of a property. We can provide you with disclosures, past sales history, dates and prices of homes recently sold nearby in Madison, and more. And, for your convenience, register for a free account to automatically receive email alerts whenever new Sauk Creek listings come on the market that match your search criteria. Sauk Creek is a quiet enclave on Madison’s far west side. Prairieland and wooded areas that surround the neighborhood are perfect for evening walks. Walnut Grove Park borders Sauk Creek to the south, east and west. There, neighbors enjoy more than 20 acres of open space, soccer fields, trails, playground equipment and pickleball courts. Greenways extend from Sauk Creek’s cul-de-sacs into the surrounding parkland and ensure that outdoor fun for children, adults and dogs are just steps away. 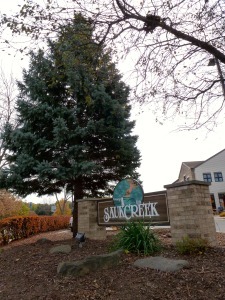 Despite its park-like ambiance, Sauk Creek is also centrally located near popular commercial corridors. The West Beltline Highway runs along the neighborhood’s western border, which makes for a fast commute to Middleton, Downtown Madison and surrounding communities. Many young families call Sauk Creek home, and holiday celebrations, parades, ice cream socials and dinner gatherings provide ample opportunities to meet the neighbors who live just down the street. Sauk Creek’s neighbors say it has a suburban feel. 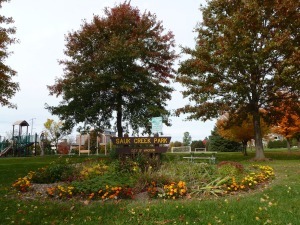 Parkland that surrounds the neighborhood and intelligent street design help foster that small-community ambiance. Many homes were built on cul-de-sacs, which reduces traffic and adds to the neighborhood’s quiet charm. Most of Sauk Creek’s single-family homes were built in the late 1980s and early 1990s. Many modern, two-story colonial houses with attached garages line the streets. The median listing price for homes in the area is $270,000. Sauk Creek offers a variety of options for homebuyers at varying price points. Townhomes and condominiums in the northeast corner of Sauk Creek bring a range of housing options to the neighborhood. Close proximity to schools, commercial districts and green space make Sauk Creek a convenient and versatile neighborhood. Sauk Creek’s central location makes it an ideal spot for people who work or play in Middleton, Downtown Madison, Verona and surrounding communities. Middleton is about eight miles west, and Downtown Madison is less than eight miles east of Sauk Creek. Closer to home, West Towne Mall is less than a mile from Sauk Creek. Old Sauk Road runs along the neighborhood’s northern corridor and features a variety of restaurants and retailers, as well as the High Point Swim Club. Sauk Creek is a short walk from the Alicia Ashman Branch of the Madison Public Library System, Madison College and James Madison Memorial High School. And an abundance of parkland surrounding Sauk Creek makes it one of most versatile communities on Madison’s far west side. Where Will My Kids Attend School? For information about finding a home in the Sauk Creek neighborhood or to sell your Sauk Creek home, contact our team for a better real estate experience. 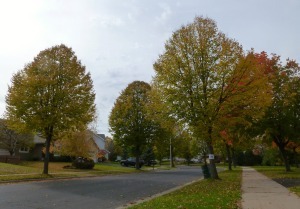 Sauk Creek neighborhood is located on the Far West Side of Madison in MLS area Madison – W05. Below are more homes for sale in that area.